I’m Jenny Q. How do you do? I am officially a middle child since the baby bro arrived. But it’s OK because he is the best little bundle ever. Even my big brother’s group Ten Guitars are well into the lil dude. That includes the gorgeous Stevie Lee Bolton with his looks that just mesmerize me! And now my bro’s asked me to handle their fan mail – I’ll be secretary to the hottest boyband in Dublin! Will Stevie Lee FINALLY notice me? But, in between babies, boys and crazy band fans, will I have enough time to help Dad or look after exhausted Mum before everything becomes UNRAVELLED? 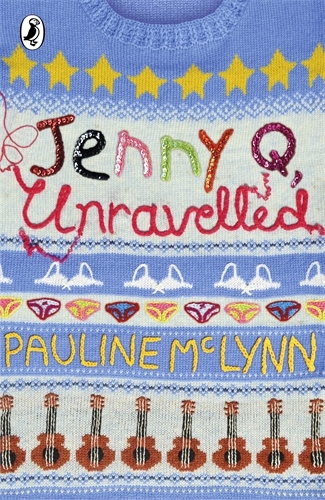 She’s funny, frank and a surprisingly good knitter, meet Jenny Q in the hilarious series from Father Ted and Shameless star Pauline McLynn.